The softbox will give a soft uniform light source and is ideal when combined with a reflector or other Strobies products to add a fill light. 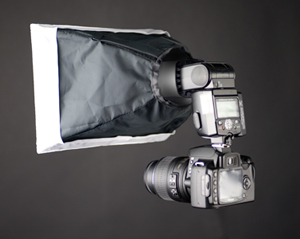 Using the softbox in iTTL or eTTL flash mode requires no adjustment to your exposure systems. 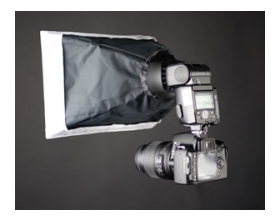 The softbox is easy to put together by following the simple instructions below. Weights Kg Lbs/oz without flex mount 0.01 0.01 size without flex mount 30cm (12") 20cm (8") Rods, Plastic/ metal Flex Mount Softbox Mounting holes. On each edge of the Flex mount you will see 4 holes for mounting a Strobies softbox,(as shown with the rods inserted). It is best to erect the softbox without the flex mount being on the flashgun to prevent any damage to the Flash gun or the material of the softbox.